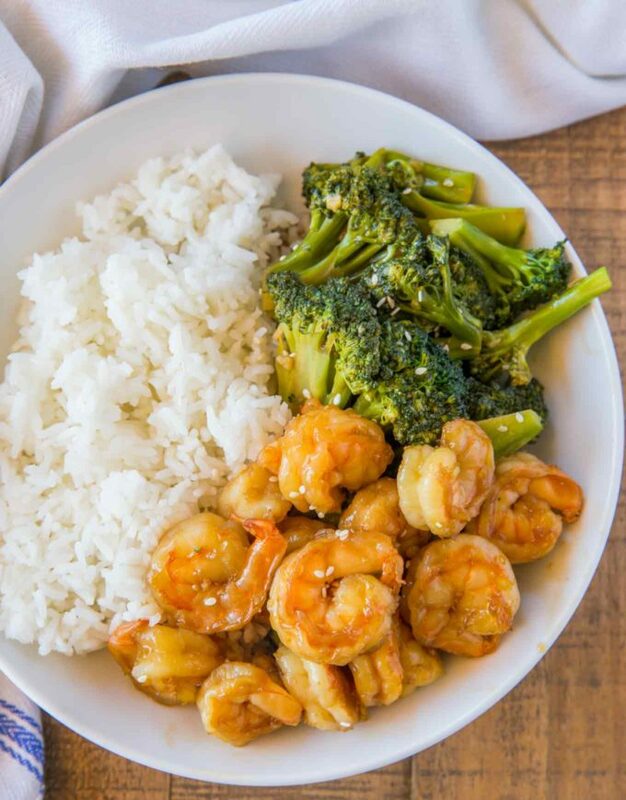 Chinese Shrimp and Broccoli made in just 15 minutes with a delicious garlic and ginger soy sauce, a perfectly easy Healthy stir fry meal. We love Chinese shrimp recipes because they’re quick, healthy and easy and this shrimp dish is no exception. We also love Skinny Chinese Orange Shrimp and Skinny Teriyaki Shrimp if you’re feeling shrimp-y but want something sweeter. 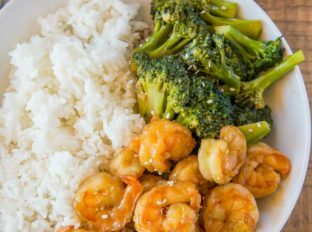 Chinese Shrimp and Broccoli was a long time favorite of ours for a healthy low point option before chicken and tofu got the point makeover with the introduction of smart points. 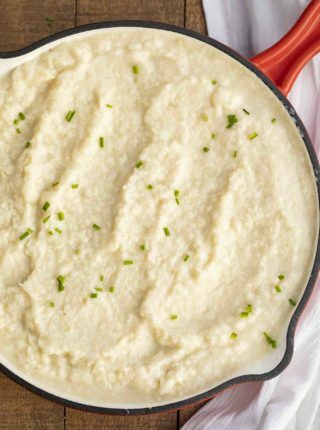 This dish has become a favorite even more now because we can enjoy such a hearty serving (not going to lie to you all I sit down with a huge bowl of this sometimes with just some riced steamed carrots under it – 2 servings per recipe instead of 6! No guilt needed!). 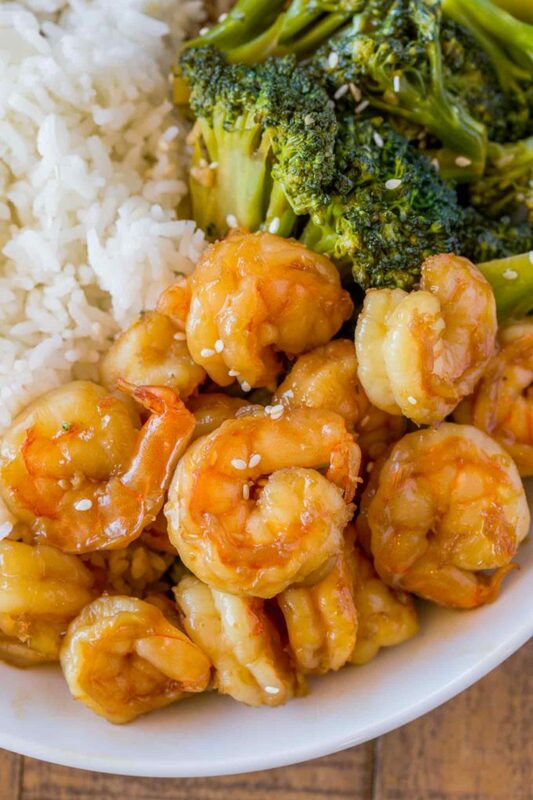 How do you make shrimp and broccoli? 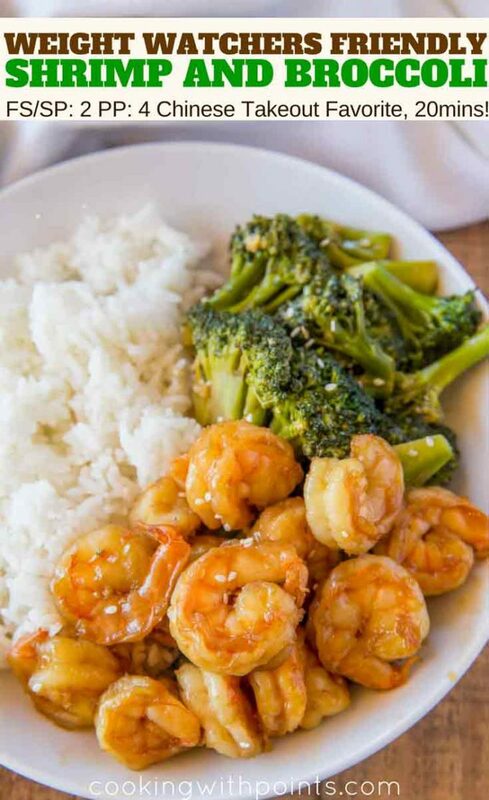 Shrimp and broccoli starts with an easy classic Chinese brown sauce recipe which is made with chicken broth, soy sauce, brown sugar, garlic and ginger. It’s cooked down with cornstarch added so it coats the shrimp and broccoli nicely. Some menus may not list this as “Shrimp with Broccoli” and may instead call it Shrimp with Broccoli in Brown Sauce. Brown sauce is a classic stir fry sauce used in many recipes and it is similar to the classic Beef and Broccoli flavors you grew up enjoying. How long do you cook shrimp in a skillet? Shrimp benefits from high heat FAST cooking, so I cook shrimp on high heat with a bit of oil for 30-45 seconds per side. Once you see a bright pink edge, flip the shrimp over to finish cooking. What veggies can be used in stir fry? We stick to the classic broccoli in this dish but classic Chinese stir fries also include carrots, onions, bell peppers and bamboo shoots. Make sure ALL the ingredients are ready to go before you turn on the skillet. Pretend you’re cooking on tv and prepare all the pieces before starting. 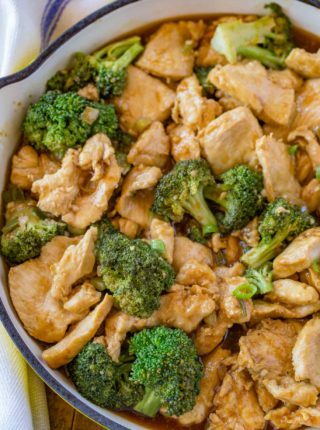 You can mix up the sauce ingredients (soy sauce, brown sugar, chicken broth, cornstarch) so you can add it quickly to the pan when the broccoli is done steaming. Don’t overcook your food, especially the shrimp. Stir fries are done, start to finish in usually under ten minutes. Cook the garlic and ginger for no more than 30 seconds and don’t allow them to brown or they’ll taste bitter. Only add the shrimp back in once the sauce is full thickened, otherwise you risk cooking the shrimp too long. Add the canola oil to a large skillet (with a cover) on high heat. Add the shrimp and cook for 2 minutes or until just cooked through on both sides. Remove the shrimp, reduce the heat to medium-high and add in the broccoli, garlic and ginger and toss well. Cook for 30 seconds until you can smell the garlic and ginger, then add in the water and cover (to steam the broccoli). Cook for 1 minute then remove the cover adding in the rest of the ingredients (mix the cornstarch with the broth before adding). Cook until the sauce is thickened, stirring frequently. Add the shrimp back into the skillet and toss to coat, then serve. 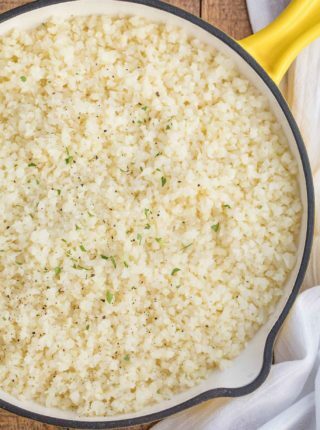 Such a healthier dinner option than take out! Love that it’s so fast to make! The picture of this is outstanding, makes it look so good!! Yum, love stir frys! That shrimp looks FABULOUS! I love shrimp in a stir fry! Your tips are really helpful too! This looks amazing. I wouldn’t need take out after all. What a wonderful meal for weeknights! 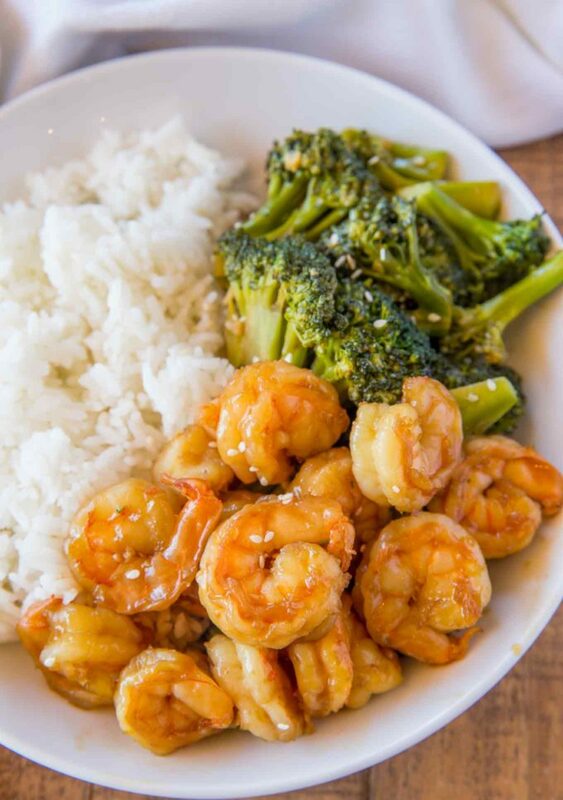 Shrimp & Broccoli….what’s not to love!? Delicious! If you really want to serve 6 people, you’d better add more broccoli. This will definitely be in my rotation. 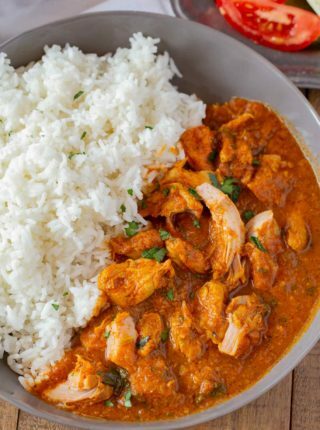 Will be making this for dinner tonight. Seems that the amount of brown sugar is missing in the ingredients. I’m going go wing it and because I’m making it for only me, go with a little honey. Sorry about that, it’s been fixed!